As RISO’s Platinum Star Partner, Midshire is the UKs leading supplier of Genuine RISO drums. The underlying technology of a RISO Duplicator is very similar screen printing. The original image file is sent to the Risograph and it is ‘burnt’ onto a RISO master, the master is then wrapped around a print drum. This drum then rotates at high speed which pushes the ink through the screen and onto the paper as it is sent through the machine. Some duplicators have one RISO drum, having a single drum however, doesn’t limit you to single colour printing. 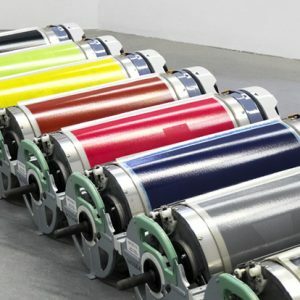 Instead, you can send the paper through once for one colour to be printed, and then change the RISO Ink different colour and pass the paper through again. 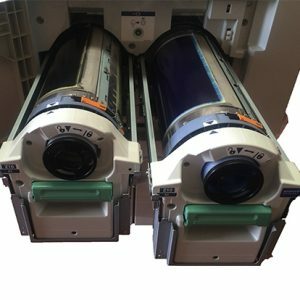 Other duplicators have two drums, enabling you to produce two colour prints at the touch of a button. Using a two drum duplicator reduces ink-drying time and the tasks of reinserting paper and changing drums. One simple action gives you the high-speed colour printing you need. However, it is still possible to do single-colour printing using just one drum in a two drum duplicator.